The search engine powering drug discovery​​​. Don't like the result? Scroll down. All supporting data at your fingertips. Plex Search is fully transparent providing all of the evidence for a search result, with direct links to the source material. Individual lines of evidence start with those that are most direct and contain the most data, making it easy for scientists to validate existing hypotheses or to form new ones. Draw or modify any molecule. 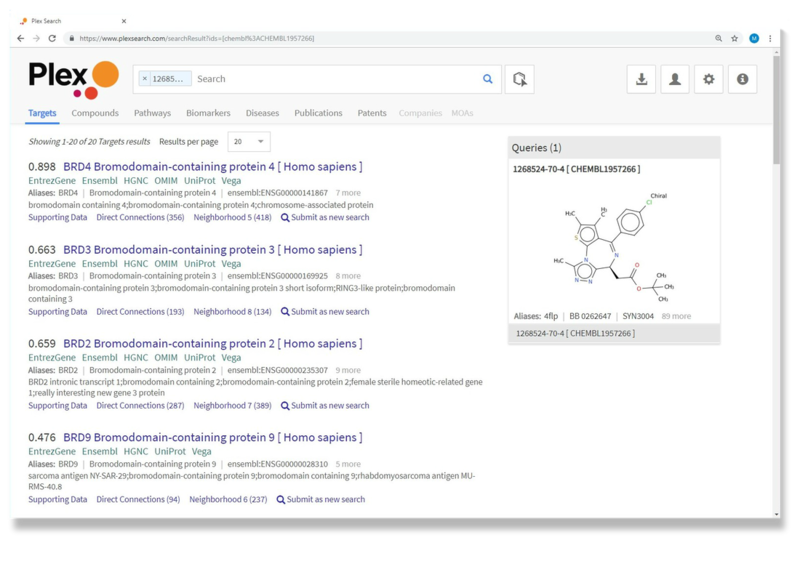 Plex Search is chemistry aware, so your search isn't limited to just your molecule. The search engine comes with one of the most sophisticated molecular similarity algorithms built-in. This 2D molecular similarity algorithm runs in every search, in real-time and automatically connects molecules in a similar space to targets, diseases, pathways, publications and patents. You can draw chemical structures, paste in SMILES strings, InChIs, InChIKeys - even for entirely novel compounds. 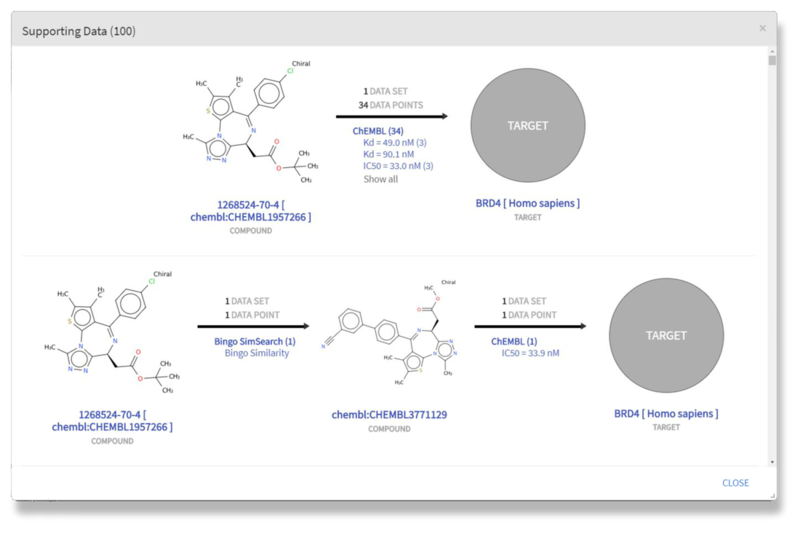 The built in chemical similarity algorithm automatically maps your compound to other similar compounds, so you can find out what is known about a molecule even before it is synthesized. This makes your search more expansive, searching all similar chemical space without having to lift a finger. Upload any data set, incorporate any algorithm. Any structured data set and any third-party algorithm can be incorporated into Plex Search, making it the glue that brings an entire organization's data and algorithms together. Connections made between two entities by a new data set or a new algorithm, simply appear as new lines of evidence. If those data and algorithm agree with other data within Plex, then the connection strengthened and floats to the top of the page. Any kind of data can be made searchable in Plex Search. While other search engines are limited to web pages and documents, Plex searches data in all its many forms – relational databases, NoSQL, flat file formats. Plex can also include AI-powered or other algorithms as part of the search - as long as they’re performant and as long as they have an API – they can be included.